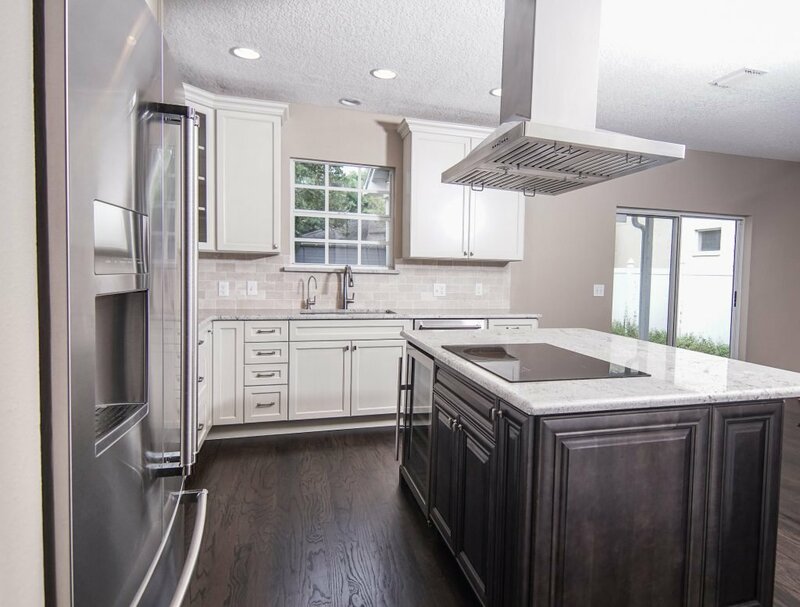 A growing family approached Emerald Contractors looking to have a whole-house remodel completed at their home in South Tampa. With one daughter, and twins on the way, this family needed their cramped and outdated space transformed into a more usable living area. 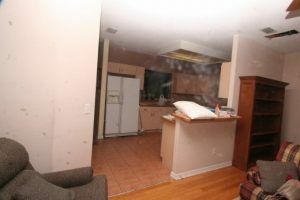 A major area of focus was the kitchen. The view of the family room from the kitchen was restricted. 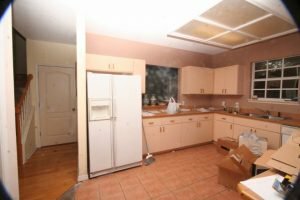 Anyone cooking in the kitchen was shut off from the rest of the family, and there was little prep space. The homeowners knew what they wanted. 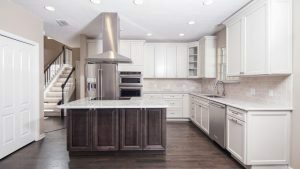 Those desires included: opening the kitchen to the family room, filling in the pass-through from the kitchen to the dining room, timeless wood cabinets, granite countertops, modern appliances and a wine cooler. As with many projects of this scale, obstacles were encountered and solutions were made by Emerald Contractors. Measuring had to be precise to get the center of the range hood straight, and this was complicated by the original hood ducting being run through the master bathroom above. The location of the wine cooler was changed after the initial installation of the hood ducting and electrical, so the ducting and the electrical had to be changed out. This affected the cabinet drawers, which had to be shortened to accommodate the 220 wiring for the range top. 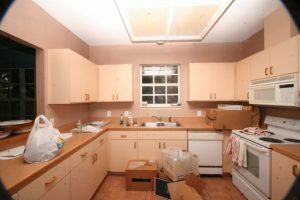 Additionally, the island dimensions had to be changed from the original design to provide for the proper walking clearances between it and the pantry cabinet and the entrance for the living room. The craftsmanship for the entire project was exquisite. 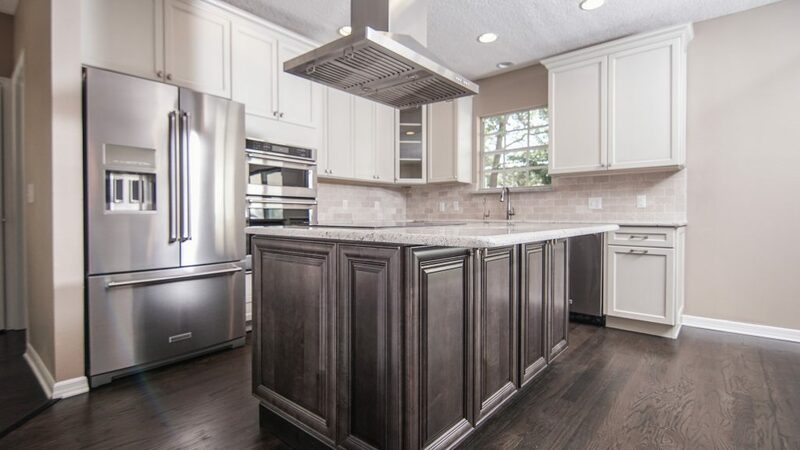 This included attention to detail on the hood, intricate crown molding with the cabinets as well as interior and under-counter lighting with touch control. The granite was flawlessly installed, and the flooring turned out perfectly. 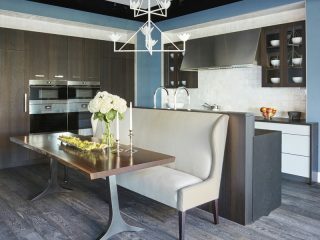 Functionally, the kitchen does everything the clients wanted it to do. It is open and airy and has all the amenities they want. Aesthetically, the kitchen is beautiful. 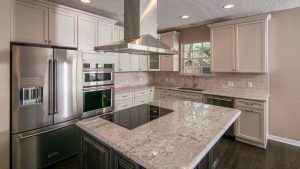 The cabinets are stunning and the granite is elegant. Most important, the clients are ecstatic with the results. 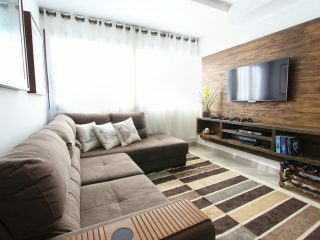 The look, feel, beauty and practicality of their choices are everything they wanted. 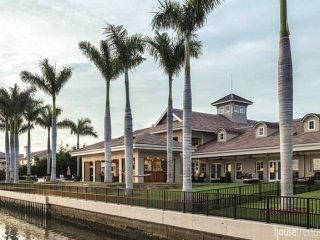 To learn more about what Emerald Contractors can do for your home, call 727-943-9046 or visit their website.